Veritas spokeshaves have been designed for smooth, effective, chatter free shaping of chair spindles, panel edges, paddles and tool handles. The 3.2mm(1/8") thick A2 steel blade, machined lever cap and blade bed achieve chatter free cutting in virtually all conditions. The ductile cast iron body is fitted with Bubinga handles, shaped for comfort and control. The toe serves as a thumb rest allowing the user to choke up on the body to attain exceptional control for fine work. Twin adjustment wheels quickly and accurately control cut depth and skew and shims let you adjust the mouth opening as needed. 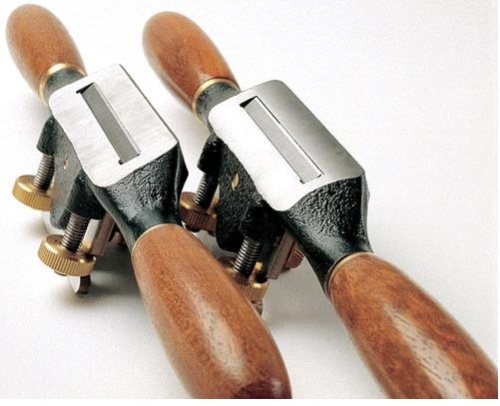 The flat and round spokeshaves are general workhorses, suited to practically every kind of woodworking. The round spokeshave has a 44.5mm(1.3/4") radius. Each spokeshave weighs about 450g (12 oz. ), 267mm(10.1/2") long overall.